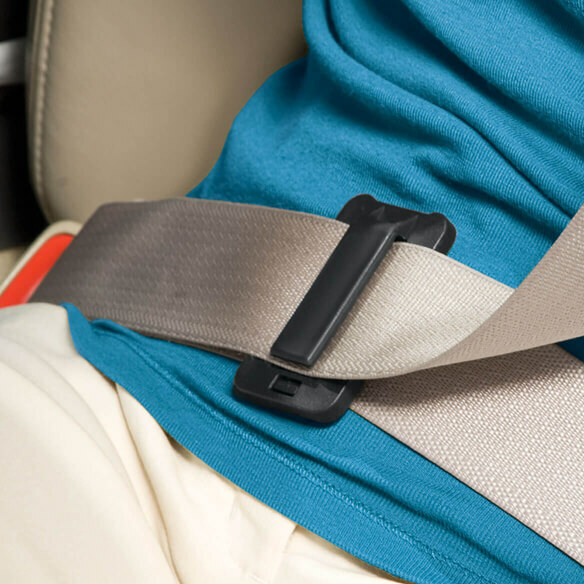 An ill-fitting car safety belt isn’t just uncomfortable, it can also be a safety risk. With a seat belt strap adjuster from Easy Comforts, you can keep your shoulder belt where it belongs – securely placed over your shoulder, not digging into your neck! The seat belt adjuster clip secures your safety belt in a comfortable position, correctly placed across the chest area and over your shoulder for optimum safety. Installing the seat belt adjuster is quick and simple: simply clip the black plastic seat belt adjuster onto the seat belt, then place shoulder strap through the top slot. The adjuster clip can be moved easily on the belt, so it can be customized to perfect fit any driver or passenger. Each package includes two plastic seat belt adjusters; use both in your vehicle or share one with a friend! Easy Comforts safety belt strap adjusters come with detailed instructions for fuss-free installation. Belt adjuster clips each measure 2 ¾” x 1 ¾”. I keep these adjusters in every car/SUV we use in the family. Keeps the belt from rubbing against my neck. I use them, my husband doesn't. Never had one break. I buy a set for every car. I love this !!!! I keep one in my suitcase and take it on all vacations to use in the rental car. Won't be without it!!!!! I love the seatbelt adjusters!!!!! This little gadget is perfect to stop the seat belt from cutting into my neck. The belt does get a little twisted with it but I can tolerated that versus always grabbing the seat belt and trying to keep it from my neck. I am short!5' on a good day.These seat belt adjusters work just as they should.It keeps the seat belt away from my neck.Mine just broke and I'm back to buy another.I've had it in my car for several years.They stood up well to heat,extreme dryness & just as extreme humidity. I always felt like I was being decapitated so when I saw these I had to try them. Unfortunately, when we got a new SUV I forgot to remove them from the last one. I bought two sets this time so I'm prepared for any/multiple vehicles. Perfect to keep the seatbelt (only thing I hated about my new car) off your neck. Great for the short woman. It keeps the belt from choking me. Seatbelt adjusters are a must for our family. We sold a car sometime ago and forgot to take my adjusters. I could hardly wait until I received my new Walter Drake catalog so I could order a new set. This great product (seat-belt adjuster) ended much frustration. I had quit using my seat-belt because it was aggravating. Now I am a safe person who uses her seat-belt at all times while in the moving car thanks to my seat-belt adjuster. Okey, I like them because I need them. However, they tend to go down the seat belt so everytime I drive I have to get them from below the end. Other than that, I would still recommend it. Thanks. Bought some of these many years ago and loved them. Tried finding them and couldn't. Bought others and was totally dissatisfied them. They broke, bent and just didn't work at all. Finally run across them at Miles Kimball and ordered 2 sets one for each car. I'm short and the seatbelt cuts right across my neck, these are durable and stay in the place I put them. I hate driving without them because I am constantly putting the seatbelt back over my shoulder. Love them. Iam short and no matter what car I sit in the seatbelt cuts me in the neck and it is uncomfortable (even the adjustable ones). So I have bought sets to go in both our cars....yes, sometimes I do sit in the passenger seat of my own car. I also put the adjusters in mu parents car and some relatives if I drive with them often. They have been so handy and Drake is the only place I can seem to find them. I have recommended them to several people as well. They work really great at keeping the seat belt from hitting your neck or going across your chest. Makes wearing a seat belt more comfortable. Gave a set to my sister and she loved them, and is going to order some. The seat belt adjuster is very easy to install and very easy to use. I use it for myself and for my passengers. I use it all the time. VERY COMFORTABLE. However it breaks easily and when the safety belt is unhooked it comes off sometimes, always have to replace it BUT when in place it is WELL WORTH. Even if it breaks I would keep on replacing it. This clip really works! It keeps the belt off my neck and makes driving more comfortable. I am going to get some of these for other family members!! It helped to save my life in a recent automobile accident. Since I am a short woman I have had troubles with the seat belts cutting accross my neck. This is such a great basic invention, I can't believe I didn't think of this myself. Works very well. It's nice not to have to constantly be holding the belt away from my neck while traveling. You should sell these in the stores. I believe this is the third set of seat belt adjusters that I've purchased. For what ever reason, I cannot adjust a seat belt for comfort and this product allows me to do just that. Please, don't ever discontinue these: Miles Kimball is the only place I can find them! Makes the ride more comfortable. This product has made the ride in the car more comfortable. I use to hate the way my seatbelt cut into my throat, now it doesn't. Holds my seatbelt securely in place without cutting into my neck. Nice product! I find this product very easy to use and I LOVE the fact that the seat belt is no longer across my neck so I don't have to be constantly moving the seat belt away from my neck area. I am very glad that I ordered this product. I like that the seat belt adjusters stay in place and are easy to use. using the seatbelt is so much more comfortable, i hated wearing it, the seat belt always used to rub my neck and now it stays where it should be. This makes wearing a seatbelt much more comfortable. I no longer feel like the seatbelt is choking me as it is held away from my neck with the adjuster. From the day I bought my first set (1992) to present, I just can't drive comfortable, without distractions, without this product. I continue to buy more, as I continue to lease throughout the years, and keep a spare one with me, when I travel in other peoples vehicles. Highly Recommended product! I can,t see not using something that works as well as these adjusters. Great seat belt strap adjuster for shorter people. We have them in all our cars and find that they work perfect! I have bought multiple pkgs of this item to use in our vehicles. They work great for myself, because I am only 5'3" and the seat belt tends to rub on my neck. This is a simple inexpensive way to alleviate that problem. I also use them for my kids ages 8 and 10 years for the same purpose. They are a lifesaver! This seat belt adjuster keeps the seatbelt away from my neck. It is easy to use. Just slip the shoulder belt under the clip. I am very happy with mine. Installation needs a very strong grip to squeeze the adjuster shut. After installed it works like a charm. Exactly what I was looking for and works perfect! A great buy! Best "gadget" I have purchased! My husband calls me the "Gadget Queen" but this is one gadget that works great! I often times would not lock in my seat belt (only pull it around me so it looked like I was wearing it) because it constantly rode up onto my neck! This adjuster makes it fit tight, secure, and safe! All my female friends have complained endlessly about seat belts choking around the neck area. Problem solved as I have given these as gifts. Today I am reordering another 12 for more friends. Wouldn't be without it and passengers like it too. My seatbelt in the passenger seat locks and cuts into your neck. This gadget was very helpful and can be adjusted to anybody who sits there. I leave it clipped on at all times so who ever sits in the seat just slides it to fit themselves. This is the 3rd set of these I have ordered. I keep giving them to friends that have used them in my car. These are great to take seatbelt pressure off your neck. Makes seatbelt comfortable. This is a great product! A necessary item for your car! I've used these adjusters for a long time and now I'm buying them for my sister-in-law! We women don't like our seatbelt cutting across our breasts!! These eliminate that discomfort! Sarah, the Sidetracked Home Executive! My wife love this product. I can drive wiwthout wrestling! I have spent my whole teen/adult life wrestling with seat belts trying to strangle me. I often would have to unbuckle and rebuckle while midtrip. It's difficult to remove once it's in place, but we intend to leave it on the seatbelts all the time. One is in the car and one is in the truck. I need to buy another set for when I drive the truck or ride in the car. Awesome product! Love this product. Have a set in every car we own. It's easy to use & makes wearing a seat belt so comfortable. No more annoying seat belt at my neck. using this adjuster makes riding in my truck comfortable for the first time! After getting one set for my car, I then purchased 3 more sets for my family. They keep the seat belt in place, and stops them from riding on your neck. Passenger no longer has to hold seat belt away from neck. Made of sturdy plastic. Love themand so do my passenger's. My mother got these for me and I have bought 2 more sets as gifts. I've lived a lifetime fighting seat belts that try to hang me or sever my head. I only found one auto accessories store that carried seat belt adjusters, and I broke 2 within a week. These adjusters are easy to use, small, highly adjustable and are very sturdy. Just TRY to find anything like them anywhere else! Thanks! Love it - no more having to adjust the seatbelt all the time!! and it's SAFE!!! Seat Belts are needed to give me comfort. I have these seat belt adjusters on both the driver side and passenger side, they are great, I don't know how I ever did without them. I also put them in my husband's car too. They are not in the way if the person sitting there doesn't want to use them. They are wonderful for the backseat seatbelts. I don't feel likethe belt is rubbing against my neck. Had one in my old car for 18 years and the adjusters were safe to use even after I had a couple fender benders. Got another set for my next car which is now 13 years old at nearly 200,000 miles! The seat belt will wear out before the adjuster will! These things make my driving safer because I'm not annoyed by the chafing strap against my old neck. The only problem is that after a few years the seatbelt gets curled up on the edges of the adjuster and the adjuster will cause seatbelt to ride up my stomach, especially since I've put on a few belly inches lately. If the seatbelts are new, the car is new, and you aren't overweight, these are great. To keep my seatbelt from chopping me in the neck, I use these seatbelt adjusters. If you are a short person, these keep a seat belt fitting comfortably. This year using them as stocking stuffers. These are great! i hate the way seatbelts sit too high or slip off. These keep the seatbelts where they belong! No more having to constantly adjust the belts. I just slide it to where it's comfortable for me. Good quality, good price. These work great! No more neck issues. bought these from an auto store,and had to return them because they popped open. These are very secure. This is great to keep the seatbelt from strangling or pinching you while you are driving. I knew something like this was out there and I was so happy to find them. Thanks! Just what I needed, am totally pleased. The seat belt adjuster is exactly what I needed for a more comfortable driving experience. No longer does the seat belt ride across my throat, and the adjuster is simple to install,only took a couple of minutes to put in place. Thank you Walter Drake. Great product! Before this, the seatbelt always cut into my neck which is uncomfortable and unsafe. I've had these in my cars for years. LOVE THEM...they make the seat belts so comfortable. I really notice it when I drive with others who don't have them because I forget how a seat belt cuts into me. I am able to adjust the belt to fit me. The are easy to install, however some friends have trouble installing them. I simply show them how easy it is...duh. I have bought these several times for different vehicles. I am rather short so seat belt adjusters help keep the seat belt from digging into my neck. The first time I ordered them I loved them, I even bought a set for a friend. Then I ordered them when I bought a new car and for some reason they wouldn't stay snapped together and they'd fall off when I opened my door. I took a chance and ordered another pair and I love these. They aren't coming apart and are working great. I had to read directions to open it, but after that no problem. I bought one for daughter/granddaughter to help her use her belt. I had a car for two weeks and ordered the product right away because I knew it would make that seat belt stops riding against my neck and it works! We bought a set for the front seat & liked them so well we bought other set's to use in the back seat & for our trucks. Ordered it for my daughter and she says it's the first time in years her seat belt has not hurt her. So nice when traveling long distances. It's so much more comforter with the seat belt adjuster. You don't have the seat belt cutting into my neck. I so glad I purchased this item. no more seat belt tickets! amazed at such a simple solution... after 3 "no belt" tickets, I buckle up in comfort with this easy to use device. Belt bothers you? Get one of these. Large busted woeman in over-the shoulder seat belts pull the belt away from their body to avoid busom pain. This device resolves this safety problem! My seat belt was always riding up to my neck and with me having neck problems to begin with it would really bother me if I would be in the car for long periods of time. Lots of times I was putting the seat belt under my arm because I would get so tired of trying to keep it off my neck area until I purchased seat belt adjuster. It works great and I love it. Love these, they work great and dont pop off. Hate to drive a car without it! I have one of these in nearly every place I may sit in any vehicle, family AND friends. I'm only 5'2" and these are a MUST for me! Use it to keep seat belts from scratching my neck. This seat belt adjuster is a "neck" saver! I have tried different products over the years to relieve the pressure of the seat belt strap across my neck, but nothing helped. This small, simple attachment has made my driving time a pleasure now. Its easy to attach, it stays on the strap and out of the way if someone else drives and doesn't need it. But its there when you need it! Sorry it took so long to try this! Fantastic to keep seat belt off your neck. I have used them forever! These little gadgets keep the cross body belt positioned away from my neck. I don't buckle up without one! I am very happy with this product, I purchase these many years ago and they are very easy to use, stay where they are suppose to and do not interfere with anything else going on. I purchased this set because somehow I lost one for one of my vehicles and I really hate not being able to adjust where the seat belt sits across my chess. They ones I bought probably 10 years ago are still working just fine. I would recommend these to anyone who needs to adjust where their seat belt crosses their chest. I liked the product. But I had no response to my request for a catalog. I have installed these in several of my cars and SUVs and love how they are easily adjustable and prevent the shoulder belt from digging into my neck. Now all of my extended family uses them, too! Takes only one second to snap in place on the lap portion of the belt -- you install it only once and it slides along that portion. Then, every time you click you seat belt on it becomes automatic to hook the shoulder strap into the device in your lap -- very simple, and no more strangulation marks on my neck! A real must have! This is the best solution I've seen for adjusting the fit of the shoulder belt and I have tried quite a few. I like that the product stays securely on the strap & doesn't twist or turn around. My seatbelt strangling me was the worst. My seatbelt always rested on my neck. In some cars, I didn't have this problem; but, in my car I did and I had it sometimes in rental cars. I bought this set of 2 and it changed my life. One is permanent in my car, and the spare I save for when I rent cars. I also have bought sets and given them away - people love them. For a small price, you can't imagine how this item improves your comfort. I am renting a car and taking a long trip, so I am ordering another set now - one for the driver's side and one for the passenger's side. I can't live without it! I'm back to order these again! When I first put these on my seat belts, I thought they would not last long - being plastic. I Was Wrong!! I love these seat belt adjusters. Being short (5'), it has been rough riding with the seat belt cutting into my neck, no matter what vehicle I was in. Now, I adjust the belt to where I need it and off my neck. They have proven to be tough and I want to order more for my other 'short' friends and family. I am reordering these now. Thanks for a great solution to an irritating problem. Very clever little product to keep seatbelt from digging into my neck...So easy to attach..Glad I found it in your catalog. This is so comfortable, keeps the seatbelt from rubbing against your neck. Adjusts easily. I 'm short and seat belts cut me at the neck. These clips allow me to wear a seat belt in the appropriate position. Simple but it does what it promises. These work the best at keeping the seatbelt from riding against the side of your neck, yet you are still completely protected by the belt. We have bought several pairs for the different cars and trucks we have owned. These are great to have on your seat belt, Anyone can adjust their seat belt so it doesn't dig into her neck and makes traveling or driving so much more comfortable without compromising my safety. Great product and easy to use. I'm giving them as gifts. I hate seat belts rubbing my neck and these seat belt adjusters are perfect. Thanks Miles Kimball. Shoulder strap portion of clip slipes out of place each time seatbelt retracts, but reinserting it each time you use the belt keept is in place and it does what it was designed to do -- keeps the belt off the necks of vertically challenged people like me. I have installed this safety belt adjuster in all the cars I have been in...even on the passenger side. My kids (adults) like it when they drive my car, that they asked me to get them a set. This is a must have for anyone who is not tall. The ONLY drawback is it cannot be re-used. The clip clicks on and stays on, so be sure you put it on right the first time. I have recommended these seat belt adjusters, and have given them as gifts. The grandkids who have outgrown car seats and boosters love them. Almost everyone who rides in my passenger seat asks where I got the clip. They want their own. If you buy these, you'll be highly satisfied. Keeps my seatbelt from cutting into my neck. So easy to install and to use. I have been using this adjuster for years. I have one on both front seats. I keep an extra at all times in case a friend needs one. I always make sure when I trade my car in that I get my adjusters. They last a real long time and I can't stand using a seat belt without one! i have had surgery and this little god send makes it comfortable for me to drive again thank you so much. These seatbelt adjusters keep the belt from digging into my neck. I bought 2 for each vehicle so I have one if I'm the driver or the passenger. These seat belt adjusters are a driver's dream. They make wearing your seat belt so comfortable and install in seconds with one easy click. Definitely worth the purchase price! I purchased 2 sets so I could put them on the belts for the comfort of my backseat passengers too. I have been using these for years. Have tried other kinds and they pop off when seat belt is released. These stay on! Need a flat head screwdriver to pop them off, :-). Got sets for two of my sisters because they were impressed with the comfort they provided and ease of use. Have them in both cars on driver's and passenger's sides, and an extra in my purse! Very comfortable and easy to attach to the seatbelt. We have a Chevy Equinox. The front seat belts adjust between the front and back side windows...no problem. The back seat belts has a thin piece of elastic with a small clip, coming off the back of the side windows which worked for just a short time and broke. These seat belt clips from MK are great. This device is great for short people. It keeps the strap of the seat belt from hurting your neck. It is a potential life saver, since it motivates you to use the seat belt properly. I have bought several to give to friends. I have been using this for over 10 years. The shoulder strap does not cut into your neck. Worth the small price. This product keeps the seatbelt from my neck. Makes it more comfortable. Easy to install. I bought more to put in our other car. The most wonderful idea for travel.Had in one car,a must for the other too. Can't imagine why they're not part of auto necessities. Difficult to be a pass.in car without. I have used these on several cars i owned and lost one of the original 2 so i bought 2 more to have a spare ! Can be used in any vehicle with seat belts. Makes using seat belts much more comfortable, and if it's comfortable you will be more likely to use the seatbelt and use it correctly. No more putting the shoulder strap under your arm so that it won't chafe your neck or choke you. Once put on they stay in place nicely. They can also be removed to use in another vehicle. Great for adults and children. I have had these seat belt adjusters before and they work very well. I am very short and they keep the seatbelt from choking me! Very quick delivery! I use the seatbelt adjuster in my SUV and it has made all the difference in the world. The seatbelt no longer slides across my chest and cuts into my neck, which caused me to readjust the belt over and again the entire trip. I now have the ability to be comfortable with the seatbelt adjusted in one position the entire trip. The adjuster is very durable and took me about a minute to install. I first bought my seat belt adjuster in 2006, and it's still in use. I want another to add to the passenger side of my husband's vehicle. Interestingly enough, the price hasn't changed since 09/06/2006! It keeps the seat belt from going across my neck and chocking me I'm very pleased with this product. I use my seat belt adjuster everyday, no more cutting into my neck. Highly recommend. makes driving so much more comfortable. don't have the seat belt chocking me or digging into my chest. I have nothing bad to say about it. I think this should be standard in all cars. I have used these before, but forgot to remove them from our old car when we got our new one. They work great so ordered a replacement pair. Have these in both my car and truck. This purchase was for friends and family. They hold seatbelt away from my neck. They are very comfortable and easy to use. The only problem is remembering to unhook seatbelt when leaving the car, so seatbelty will retract easier. I no longer feel 'strangled' when I 'ride shotgun', and it's easy to adjust to allow for heavy coats or kids. Once we used them, we were instant fans and won't be without them. Glad I got this. Works great! I dont' have the seat belt cutting across my throat anymore. In California there is a law that all passengers on tour buses must use the seat belts. As a person who is only 5'2" the belt CUTS me right across my neck - very painful. Tried this last week and it really made the trip much more comfortable. I also bought the Sherpa seat belts covers which added to my comfort. No longer will I have to use my sweater, jacket, etc to keep seat belt from cutting into my neck. the best thing ever, I use to tie my seat belt with a plastic bag, plastic because it would adjust easy. this is great. A great invention! Makes seatbelts much more comfortable, prevents the seat belt from rubbing against my neck. Very sturdy and well made. These are great if you are only 5'1"
I have had mine for 20 years but I lost one and I always wish I had an extra one when I am a passenger. I have never seen them anywhere else. These little devices are the best thing ever for those like me that don't like seat belts putting pressure on my throat. I have one in every vehicle. Love it - now I don't have to constantly fight with the seat belt to keep it away from my neck. Glad I purchased it. I am short, and prior to purchasing this, sitting in the passenger seat meant that the seat belt would ride up around my neck, cutting off circulation. With this handy gadget, the seat belt remains in the proper place,as it should. I now have the adjuster in my husband's vehicle also. I'm ordering more for my niece. Very handy in my SUV! My comment is the same as above. My Second Time Buying This Product because I Needed MORE! I love these! I left my last ones in my vehicle I traded in and felt lost without them in my new car. I purchased two packages as I have school age children that have the same issue with the car strap hitting them in the neck and irritating them. The are easy to install and easy to use even for my children. I love these clips. I recommend them to everyone I meet. I WAS TIRED OF THE SEAT BELT RUBBING AGAINST MY NECK CONSTANTLY. VERY UNCOMFORTABLE. WITH THIS CLEVER DEVICE, THAT HAS STOPPED. I CAN DRIVE WITH COMFORT AND NO LONGER HAVE TO KEEP YANKING AT MY BELT. EASY TO INSTALL, JUST FOLLOW DIRECTIONS. This product is a best,because I'm a short person and give you a comfort in the car when you are driving. makes the ride much more comfortable especially long distance riding and driving. I'm also "height challenged" and most seatbelts either cut across my neck or my chin. This adjuster makes wearing a seatbelt safe and comfortable. I have used this product before and when mine broke, was delighted to find Walter Drake had them in their catalogue. It sure does take the pain and uncomfy part of a seat belt off of one's neck! AS A SHORT PERSON, IT KEEPS THE PRESSURE OFF MY NECK!! I had the Seatbelt Adjusters on my car and I traded it on a new car and so I needed the same on my new car and was thinking about it when I got the catalogue. Thank You so much! I love them and they work great! They are great because they don't cut in on my neck and feel like I am choking. I have them in both our cars - driver's and passenger seat belts. I even have them in my brother's car. We purchased a set from an auto store - they were garbage. These work the best. Love them!!!!! Now I can wear my seat belt. I have them in all our vehicles,my daughters also we are short and seatbelts hit us across our chins.These keep them on our shoulders and are comfortable.And they are simple to use. Easy to install and actually works to keep the seat belt from being up at your neck! Great Product! Does the trick! Was sick of the seatbelt cutting into my neck all the time, so I would wear the seatbelt incorrectly. Then my daughter got a ticket for doing just that! So, I bought a packet of 2 and we both wear them now! Problem solved! #Sweepstakes. My shoulder seatbelt always dug into my arm. This really helps! We have never had anything just like them,And As I can see we will not send them Back,We Will use them Each Day as we Eat,And the other,we will use when we need them. FINALLY, MY SEAT BELT IS COMFORTABLE OVER MY CHEST. I'm so used to this seat belt adjuster, I don't think about it much, unless I'm in another relative's car. Then I notice I'm not as comfortable. East to use -- I thought it would be complicated to install, and it couldn't be easier! This product works great! Sent it as a gift, and I also have one. Keeps the belt away from the neck and shoulder area. they really work and I love them! they are easy to attach to your seatbelt and stay attached.they make driving much more comfortable....no more yanking the seat belt from my neck it stay across my shoulder. I've been looking for something like this for quite awhile. Even with the adjustments I can make on the seat belts in the car it just wasn't enough - the belt cut across my neck and was very uncomfortable. This clip works perfectly and it's easy to use. I have purchased this product a couple times. have purchased this product in the past and they seem to do the job intended for. Safe and Comfortable At Last!!!! I strongly believe in seat belt use but as a plus size female...I was always uncomfortable with the belt across my chest almost choking me as I drove. FINALLY,I have been provided a tool that has resolved that problem. The adjuster is not loose yet it is not extremely tight. Thank you, thank you, thank you. I was so tired of being choked by my seat belt now I do not have to worry about it anymore. I have used these seatbelt adjusters for a long time. I've had them in all our cars for many years. Wouldn't be without them. I no longer get my neck scraped by the seat belt. I have also bought them for members of our family who liked ours so well them wanted them as well. Great little gadgets. I love this seat belt clamp. I love having this on my seat belt. It keeps the strap away from my neck. Before I used it the seat belt strap would rub on my neck since I'm not very tall. I am no longer being strangled! This rather inexpensive item is a real winner! Until I bought it I was always fighting with my seat belt strap because it rubbed so irritatingly against my neck. The inventor deserves every penny he/she earns for coming up with this clever solution. I'm short so the driver's side seat belt always rubbed on my neck. These seat belt adjusters solved that problem. I have them on both seat belts in the front seat of my car, and one in my husband's car. They make driving and riding as a passenger much more comfortable for me. Love these so much I'm Buying more! It keeps the seat belts in our big Dodge tucks from rubbing my neck sore. I am buying more for all my vehicles and a few for gifts! Absolutely love these seatbelt adjusters. I have gotten so used to them that I look for them in other peoples cars and recommend them to them. My friend bought two sets because of my recommendation - one for herself and one for sister in law. Both love them too. Finally a belt that fits me. I am 5'1" and my hubby is 6 foot. Now I can be comfortable without the seat belt across my neck. So easy to use. 4.5 stars. I bought these as an impulse buy once in an auto shop 6 (?) years ago. I'm a pretty petite lady, and my seat belt was always cutting into my neck due to my short torso. They clipped right on and worked perfectly from the get-go. The only con I can think of with these is that I found them impossible or near-impossible to remove. 5 stars if they were easier to remove. I've gotten a new car since originally buying a set, and I'm so glad I've found them again to put in my new car!! I use it all the time it keeps the seat belt from choking me in the neck and it lasted for a year. It is made of plastic and i dont recommend to use with children. use Child car seats for kids. Whoever made this it is really a great thing to use for driving and keeping the seat belt from sticking you in the neck. These things are awesome. I was so tired of the seatbelt cutting into my neck.... these are the best and I highly recommend them!! Keeps seat belts from riding up under your chin. Much more comfortable. I have them in all my cars and now bought one for a friend. Short people need these. neck strap is held away! Easy to install. Stays in place. When slid 4-6 inches away from the seat-belt connection,it keeps the belt from rubbing against my neck! It does just what I needed it to do. Seems sturdy and the tab that slips over both belts has stayed clamped after a week of in and out of the car. Perfect purchase! i love my seat belt adjuster,bought one for a friend and she likes it to.this is my 3ed order. it's great for shorter people the belt dos'ent hurt your neck and you feel more at ease driveing.can't do without it. great for us short people! I bought 2 sets of these, just to make sure I had some in reserve. One broke after 8(?) years of use. I use them both as a driver & a passenger. It keeps the shoulder belt from going across my neck. I'm 5'2", and this really is a great find. Not much to them. I like that! They improved this product. It is now one piece! You cannot find them in the store any more. I cannot stand the seat belt rubbing my neck and this product keeps that from happening. Love it! I hate to drive without this seatbelt adjuster! It allows me to adjust the shoulder strap just enough to keep it from scraping my neck without compromising safety. Others I've tried broke just trying to put them on the seatbelt! These adjusters are long lasting and a good price. I was not expecting it to work but I said; I have to at least try it. It worked great!!! It holds the seat belt where it should me I wish I would have found this 5 years ago!!! These things are awesome !!!!! I've bought all kinds of seatbelt holders and pads. These are the best. They keep the belt away from your face and neck. I've bought them before and will buy more. I work for a van service and we have 20 cars. Everyone loves them. I have purchased many, many of these. I have given away so many of these seat belt adjusters. Virtually everyone who has ridden in my car has wanted them. So, I order some more to give as gifts. I am short and American cars are made for 6 footers. Even with the adjustment to the lowest level the harness was cutting into my neck. I love it. Since 2 came in the package, I shared one with my neighbor as she has the same problem I do. Seatbelt Adjuster Saved My Neck!! I was looking for this for such a long time and finally found it for sale at Miles Kimball. Each and every time I would fasten my seatbelt, the seatbelt would tighten up right around my neck. I would pull it lower as I was driving, and it would only tighten up again (as it is supposed to do). Now, with the adjuster, it moves the seat belt slightly to the left and off my neck completely! No more strange red marks on my neck after driving! It's a big relief for me. Thanks! As long as these are one piece, they are great for keeping the seat belt from rubbing your neck. I have had these for years in all kinds of vehicles. For shorter women, they are a life saver, keeping the strap off your neck and in a comtortable position across your breasts - your clothes will thank you as well. It is also versitle because you can either clip it or not; it does not get in the way when a taller person does not use it. OMG - THIS TOTALLY WORKS! For years, I have endured my seatbelt strangling me. I was always pulling on it. I saw this item in the book, and it was cheap enough to give a try. I really didn't expect it to work. I was SO pleasantly surprised when it not only worked -- it worked GOOD. I liked it so much, I bought my friend one too. 2 come in a package, so you have one for you and your passenger, if need be. I use the second one for when I rent cars. Seriously, buy this product if your seatbelt is uncomfortable and against your neck! The price is so cheap, even if it doesn't work for you, you haven't spent that much! Use it in the front seat of my son's and granddaughter's car. I am short so it keeps the belt off my neck. Love it and did buy another set. Being a short person driving, the belt always pressed on throat causing much discomfort. Now the belt is kept away from my throat and I am a "happy camper". It took but a short time to learn how to engage the black plastic attachment, but now I do it quite quickly. Thank you so much. This the best seat belt adjuster on the market. I've had one in each of my cars. So had to have one for my new car. Because I'm so short the belt always rubs on my neck and I fell like I'm being choked. I have tried others but they don't work as well. They don't hold and keep slipping off. Don't get rubbed at the neckline any longer! Ordered several times. In several cars. Love not being strangled by the seat belt anymore. These make driving comfortable again for those of us who are vertically challenged. They keep the shoulder strap from cutting into your neck. I can't live without them!! I LOVE this gizmo. It helps keep that safety belt from cutting my neck. The only problem was I couldn't get it off my old car when I sold it so I have to get a new one. Wish I had bought one sooner! I have one of these on both driver and front passenger seat of all our cars! I also carry one when traveling for use in a rental car. I am 5' 2" and find shoulder belts not only uncomfortable but potentially life-threatening in an accident. With these adjusters I am very comfortable and feel much safer. The seatbelt adjuster works great for short people so the seatbelt strap does not go across your neck. This really works! I bought a KIA soul last year and after I bought it I noticed the seat belt was strangling me! not good! If your in a car accident and the seat belt is NOT worn correctly you can get hurt even more! The dealership could not help me with this issue, so I bought this little device and it works! hubby helped me put the clip on the belt, it stays there on the belt..when I put my belt on I just slide it onto the cross strap. FYI; no directions come w/ this! It makes the seatbelt so comfortable. I drive a school bus and have put them on the seatbelt and boy does it ever help. One may think that your car seatbelt gets in the way. The ones on a school bus are worse. These adjusters are great. I am ordering another set to have on hand. The last set I had broke and sure do miss not having it there. I also have a set in my car and wouldn't be without them. The car that i just got had seat belts that choked me and would have broke my neck in an accident. I was constantly readjusting them for comfort. The adjuster solved my problem totally! Love it. I love this product. The seatbelt always cut my neck no matter where I tried to place my seat. This adjuster made all the difference. You adjust it where needed and when my husband drives my car, he just doesn't hook in the belt as he doesn't need it. I have the extra one on the passenger side for when I'm there. Highly recommend this. It clips on to the lap belt, then you slide the chest strap onto the top and it holds the belt still. I bought a set of these about 10 years ago and when I sold that vehicle...it had to go with it. Once it's securely on the seat belt..it's there to stay...I bought a set at Auto Zone and it would not stay attached to the seat belt in my new car so I ordered 2 more sets..one for me and one for a friend of mine.. This is the first order of the adjusters for me. My first was a gift years ago. It finally broke, so I hunted for the item on the net. I love this adjuster. Keeps my seatbelt from cutting into my neck. My sister got some at least ten years ago and I saw hers and begged for some of my own! When you're short, the seatbelt always rubs your neck. Even when you're not short! I'm buying some for my friend who saw mine and wanted some! They are great! Everyone should have them. Remember that when you get a new car! this seat belt adjuster is very helpful in making my driving experience safe and comfortable. I am a short female and this product is just what I need to make my driving more relaxed and secure. family trip.when we got there i didnt have a red mark on my neck like i did before i got these. I would not drive without this. I recommend this to everyone and even buy them for gifts. I love these seat belts adjusters as they help to keep the seat belt on my shoulders and not near my neck. Work great for my car! search ended! I am short. This adjuster stops the seat belt from hurting me. Being a ten year bilateral mastectomy patient, who had implants placed five years ago, I can attest to seat belts being "uncomfortable." I placed one of these little devices in the passenger seat of my husbands van ( which is handicapped accessible for him,) and one in the driver's seat of my smaller car. They both work to keep me comfortable. No more twisting the seat belt to keep it between my chest! I'm properly aliened and safe to travel! I have installed these in both cars and our rv. Seat belts tend to rub my neck without them, so I make sure we have them in every vehicle that I drive. One of the best thing I bought from you. It makes me feel comfortable when driving because the seatbelt no longer interfere with my neck and body movement. Perfect product for Woman with a Chest. I have bought a total of 4 sets of these. Ever girl friend that rides with me had to have a set. It moves the seat belt to a position that does not cut into you neck or smashes one side of your chest. Easy to use and install. I have bought this product before . They make the seatbelt more comfortable. The adjuster makes riding very comfortable and function well. I recommend this little neck-saver to anyone who is shorter than 5'4". The first one I ever got was a gift. Now I am buying my 6th pair! and am giving some of them to my short loved ones! You do have to get used to jiggling the retractor and hooking the belt in place each time, but the relief from feeling strangled, and the awkwardness of having to unbuckle, stretch out, and rebuckle the seatbelt so many times on short and long trips, makes it all worthwhile! This is the best seat belt adjuster; I have used different brands and the quality is not as good as this. Makes driving more pleasurable because the belt is not resting on my neck. I drive a lot. I am short and the seat belts cut into my neck. These are great. I can ride in comfort now. I love these things ! I have used the seat belt clips for years. They are the only product I can find that prevents my seat belt from choking me and chafing my neck. My daughter loves them too and has me get some for her car. Eventually (after about a year?) the clip that holds the belt will snap and you just need to pop on a new one. I can't drive without it! A great product! The title says it all. Easy to attach to seat belt. If it doesn't slide, you caught the belt in the clip. Give it a gentle tug to free it. Buy a lot of these! The design on these has improved dramatically. I purchased 4 sets for 3 of our vehicles. I love them! I love my car but have always hated the seatbelts because they choked me, but now I can drive in comfort and no longer have to worry about distraction. We have a new car 2014. I am shorter and the seat belt was cutting me in the neck even though I put the adjustment on the side wall down a low as I could. This seat belt adjuster has helped me a lot. I put them on both the driver and passenger side. It just stays there available when ever I need it. I would buy this product again and again,They are very good. I recommend this to a friend. Thanks again. Love the product. Be careful when first placing it because once you click it close, it is hard to remove. The first time I placed it, I could not figure out how it was going to hold the strap. Then I figured the clip needs to be facing down so that you insert the strap from the bottom open end. Be sure that before you click it close, the clip (such as in the old money clips) is facing down. You can slide the adjuster on the seatbelt to fit your needs. PS. The adjuster once in place is not meant to be removed. Remove only the cross strap that is being held in the clip. I have bought these seat belt adjusters for all the cars that everyone in my family has. Even bought some for friends. They are fantastic. This is one of the best items I have ever purchased. I was so annoyed at the seat belts always cutting into my neck because I am very short. Use the adjustors to eliminate rubbing on neck. and bought these to have on hand for future use. these protect the person who has a pacmaker or an ICD unit from the seatbelt. It is also great to keep it off your neck if you are short. I try to keep extras. Keeps the belt away from your neck. use these adjusters in my car and my truck. Have had no problem with them. They are very easy to put on the seat belt, and slide up and down easily. Have tried others, and they broke. These are very durable. I use them on any vehicle I drive. I am short and seat belts usually come up across my neck. These adjusters keep it down, so comfortable. Excellent well worth the money. Very easy to install. Holds seatbelt firm and prevents belt from riding up and chocking wearer. lots of comments from passengers. Doesn't interfear with locking or unlocking seatbelt. buying this again for my husband's car! Perfect!! These are absolutely the best seatbelt clips that have ever been made!! Have one in all of our family cars - passenger & driver seats. Have left a few in cars we've sold - and always gets a positive response. Seem to last forever if you don't take them off & on - only ever had one break in 10 years. Can't get on the road without one anymore - so I carry one on business trips for the rental as well! Only negative - it tends to slip over time, but so gradually and is easy to slide right back up that it's not really a negative - but don't expect it to be nailed in place. Had these clips before and left them in the vehicles I traded in so had to order another set. Seat belt would cut into my neck and was very irritating but these clips situate the belt away from your neck but still provide the satiety needed.